The Cartoon Cave: Me & 'Varo! This is my buddy, Alvaro Cervantes. I've known Alvaro for over 20 years now, since soon after first moving to the Toronto area. This rascal was working at the time for "Lightbox Animation Studio", run by my friend, Greg Duffell. He was a real talented kid even back then, and he was always keen to show me what he'd been recently working on. 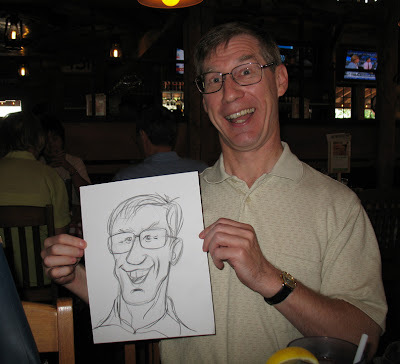 Some years later, when I was going to be leaving my job as a character illustrator at Disney Canada in order to transfer down to WDW in Florida, I recommended that they hire Alvaro as my replacement. They did, and he ended up working there for about the next 10 years. One thing that Alvaro brought to the job in addition to drawing skill, was a real talent for sculpture. He'd been dabbling in it for only a short time, but he really developed that ability in leaps and bounds. As a result, that department became far more involved in the design and development of dimensional toys for its various licensees, primarily due to Alvaro's initiative. We've stayed in touch all through the years, including one time when Alvaro came down to visit me in Florida, where I got to introduce him to a bunch of the guys in the WDW art department, as well as several of the guys over at Disney Florida Animation (sadly gone now, having been shut down a few years ago.) 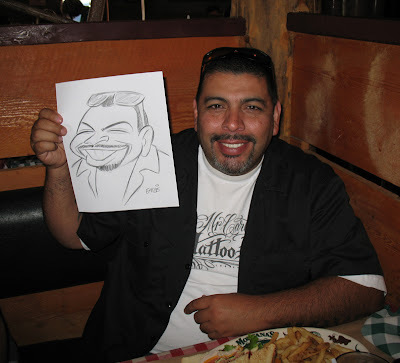 Last week, Alvaro and I got together for lunch at Montana's and I suggested we should draw each other and post the results on our respective blogs. Here are our funny looking mugs for your amusement. YOU ARE TOO KIND PETE! Thanks for being a great mentor and friend! I learned so much just by looking at you're MASSIVE BODY OF WORK that you left for me to pick up when I replaced you. 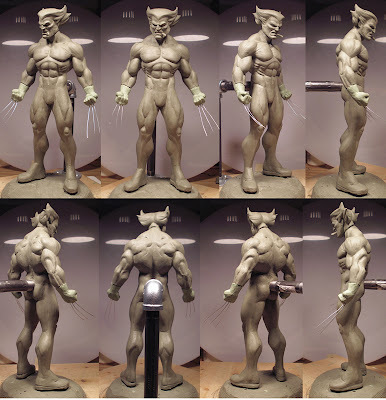 Also don't forget that you were the actual guy that inspired me to sculpt to begin with!! I wish people could see you're sculpt that started it all!! REMEMBER you're Brer Rabbit????? I hope one day you show these fine folks out there your stuff! Show me pete! show me! heh heh. My model of Disney's Br'er Rabbit is the work of a fan who merely dabbled in sculpting - definitely nothing to write home about. Back then I used to sculpt some of my favourite Disney characters simply because there was nothing out on the market at that time that was a good representation of them. In the years since, however, there's been all of those exquisite Disney bisque figures from The Disney Classic Collection, most of the best ones sculpted by that great craftsman, Kent Melton. Both Kent and Alvaro are much better than I could ever be in that medium. I must admit, though, I'd love to try my hand at it again with Sculpey, perhaps doing some caricatured sculptures of my favourite performers from yesteryear. Maybe I'll come to pick your brain for good tips, Alvaro! Hey, I see that ol' Bursey has found my site. Are you back in town yet, Rob? Both you and Alvaro are inspirations to guys like me. The passion you guys have for what you do just keeps me wanting to learn and improve daily. I so wish I would have brought my camera when we all got together for dinner back in July! Oh well, next time. You guys rock, as always! Yeah, I thought I should have brought my camera that evening too. That was a nice dinner, talking shop and reminiscing. Your buddy Rob was a hoot, too! You guys are funny but I got mad respect for the both of you. Yeah, yeah, sure...just pay me that five bucks you promised.